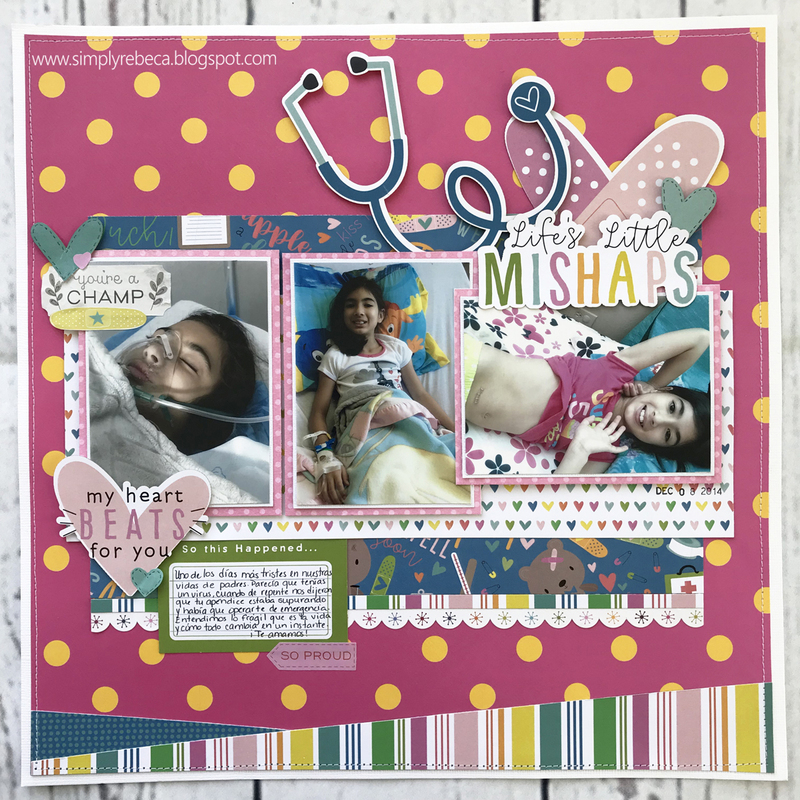 Today I’m sharing a layout I made for the saddest day of our life’s as parents. Our daughter was sick at midnight and we took her to the ER, there, the doctor did some blood tests and never came back because he had a stroke (thankfully he survived and is doing great). At 6 am some doctors came to the pediatric ER in the hospital and started attending other patients with worst situation, my daughter appeared to be having a vomiting virus and that was not a rush like other cases in the ER. Finally, a doctor came to us because she recognized our daughter from school. She was not supposed to attend her, it was another doctor who have her record, but she asked for permission and started attending her. To make the long story short, she ordered a CT Scan not matter everything was pointing to be a virus. 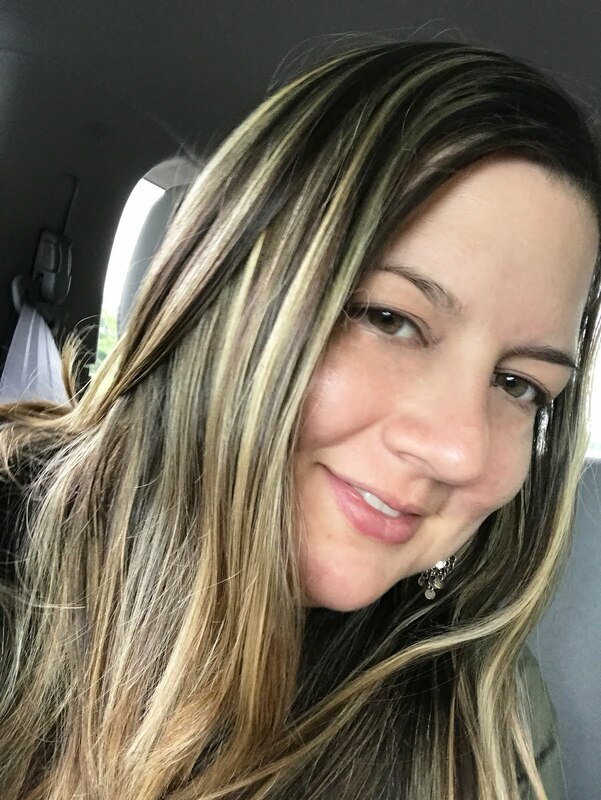 The CT Scan was not made immediately because our daughter was vomiting the contrast she needed in order for the radiologist to perform the study. At the end, the test was done around 12pm and at 3pm, the doctor's shift ended, but she called the radiologist to his personal phone because she needed that result before leaving, and he asked for a few minutes to read the results. That was something she doesn't have to do, but she wanted to do it before leaving. He called her back and told her our daughter needed and emergency surgery because she was having an appendicitis and it was already suppurating, which means it was pretty rush. The doctor stay in the hospital, and gave us the bad news and call the director of surgery of the hospital to his personal phone. He was in the road but told her to prepare everything because he was going to arrived in 15 minutes. Everything happened so fast, people started coming to us with papers to be sign, then we were moved to the surgery floor, I changed her clothes for the surgery ones and then they asked us to say goodbye to her while they took her to the surgery. We were in shock, we didn't have time to think, just to trust God and asked for him to be with her all the time and be the surgeon. Everything went perfectly, the doctor told us a few more minutes would have been a disaster because of the suppuration. We are really thankful to the ER doctor. Our daughter was not having the common symptoms of appendicitis because hers was inverse, this was the reason why she was only having vomits and a little fever. The doctor said, something told her to do the CT Scan no matter it was looking like a virus, and she follow her guts and faith. Now, we think about all that and understand God’s purpose. Maybe if another doctor have taken her case, she would have been released with medicine for a virus and the end would have not been the same. Sometimes we don’t understand why things happen but we must trust God because He always have a reason. 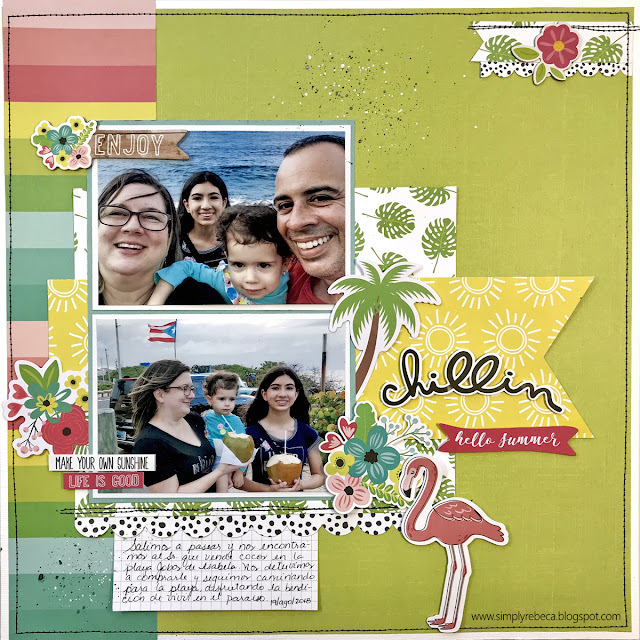 To create this layout I used the PhotoPlay Under the Weather papers and die cuts. This is a very bright, colorful and cute collection. I like it because no matter this was a very hard situation for us as parents, the end was a happy one and I don’t want to remember it with sadness but with gratitude. She is now with us thanks to that surgery and she is healthy and enjoying life. Today I’m sharing a Harry Potter's layout I made for my daughter. I already made her a mini album that I shared before (you can see it here), about this experience but since I still got some printed pictures and papers, I decided to make this page. During her 13th birthday we went on vacation to Orlando, Florida. 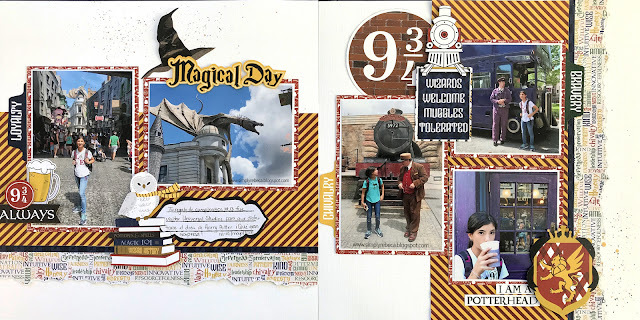 It was a trip decided at last moment with the idea of surprising her with a visit to Universal Studios so she could enjoy the Harry Potter area because she loves it. In the summer of 2016, she started reading the books, since that moment she has read all of them like three times and she is always looking for some Harry Potter info on the internet. We knew that taking her there would be a great surprise and it was. We gave her the two days tickets to Universal once we were in Florida, she was thrilled! Hope you are having a great day! Today I'm sharing a layout I started yesterday with the mixed media, but leaved it overnight to dry and today finish it Is about my baby daughter who loves to wear dresses but not so much hats or anything in her hair. When she is wearing a hat or something, I take photos fast because those moments don't last long, that's what the journaling tells. This layout looks very busy because of the mixed media and butterflies, but the truth is, it is very fast, easy and made with only a few papers. 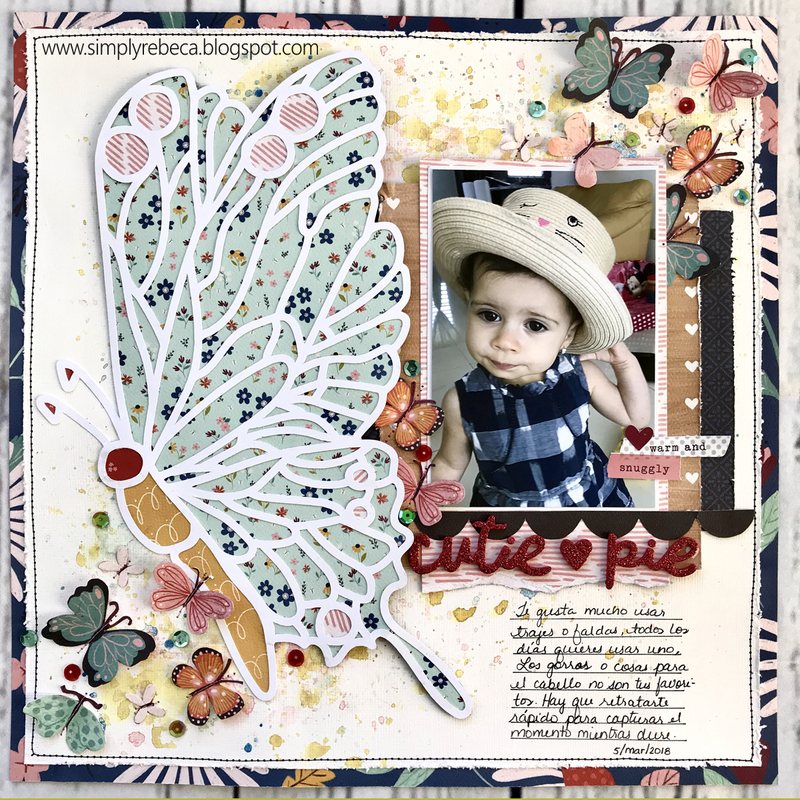 To create this layout I used the Our House Collection by Carta Bella. The colors of this collection inspired me, they are very girly no matter the main theme of the collection is for the home (cooking, baking and gardening) stuff. But since it also have some flowers, butterflies, lines and papers that can be use for other themes, I bought all the papers from the collection to create some projects. My daughter graduated from sixth grade in 2017 and this is the first layout I make of that moment. It doesn't have the traditional black and white graduation colors. 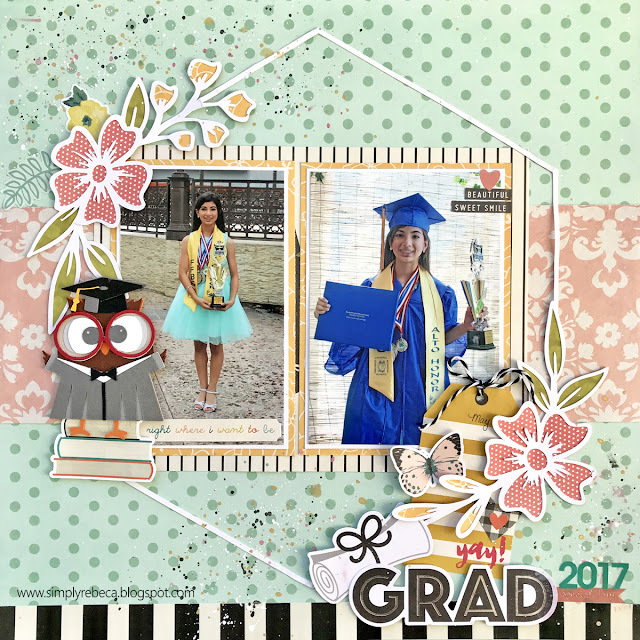 The graduation robe was royal blue and my daughter’s dress was aqua so I decided to use some not graduation papers to enhance her dress and beauty. I’m from Puerto Rico, a beautiful island in the Caribbean. Living here is a blessing, all year is summer, everywhere is a beach and the people is always happy and having fun. We can say we live in Paradise! It is very normal to us to go to the beach or just pass by it and enjoy the beautiful view and tropical weather all year long. These were some photos we took with our phones in August 2018, we were at home and decided to go to the beach area to see the water and enjoy the beautiful view. In our way, we found a nice man that sell coconuts full of sweet water and we stopped to purchase some. We enjoyed our coconuts and since we were out of the car, we decided to walk in the beach and took some photos. We were not dressed in beach cloths, but that didn't stop us, we just enjoy the moment and the blessing of living here. This has been a busy week, but finally yesterday I had some time for me, so I took it to create this layout I'm sharing today. It's about Mary Poppins, my all time favorite character from Disney! Every time we visit the parks I try to find her for my daughters' autograph book and to take some photos with her. 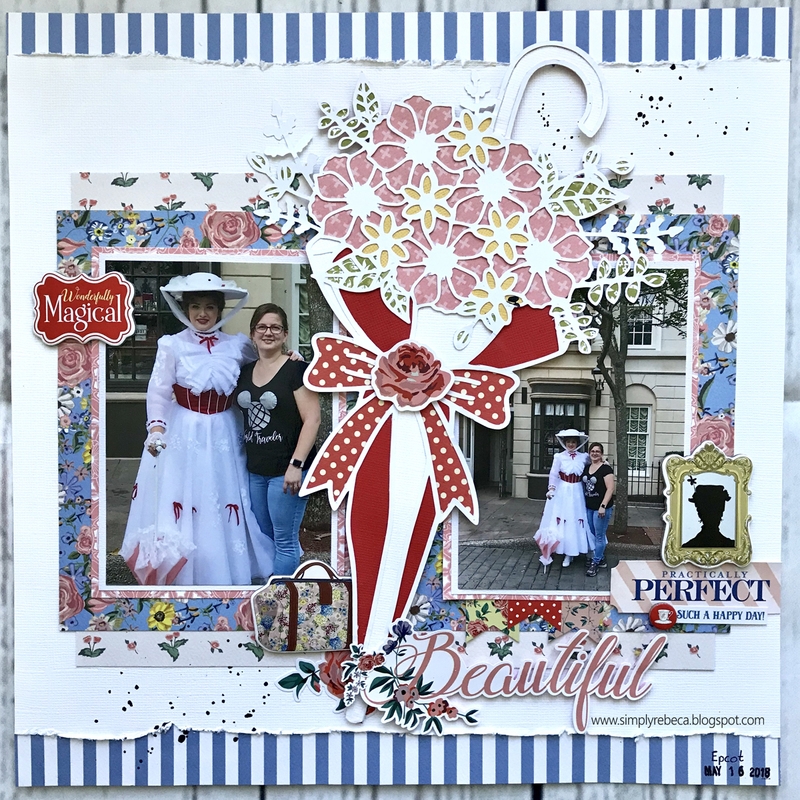 Immediately after seen the beautiful umbrella cut file from The Cut Shoppe I knew I was going to use it for a Mary Poppins layout with the Practically Perfect collection kit from Carta Bella that I had since it was released last year. I love the result, is a clean, simple and elegant layout that represents pretty well the character of Mary Poppins. In 2016 we went to the Kennedy Space Center, it was an amazing experience. Since we love science and all that stuff, having the opportunity of seeing the shuttles, equipment and all that information available there was a dream come true. There is so much things to see, learn and explore that we couldn't see all, so we need to plan a new trip there, especially me, because I was pregnant at that moment and don't knew, so I was pretty sleepy all day, lol. 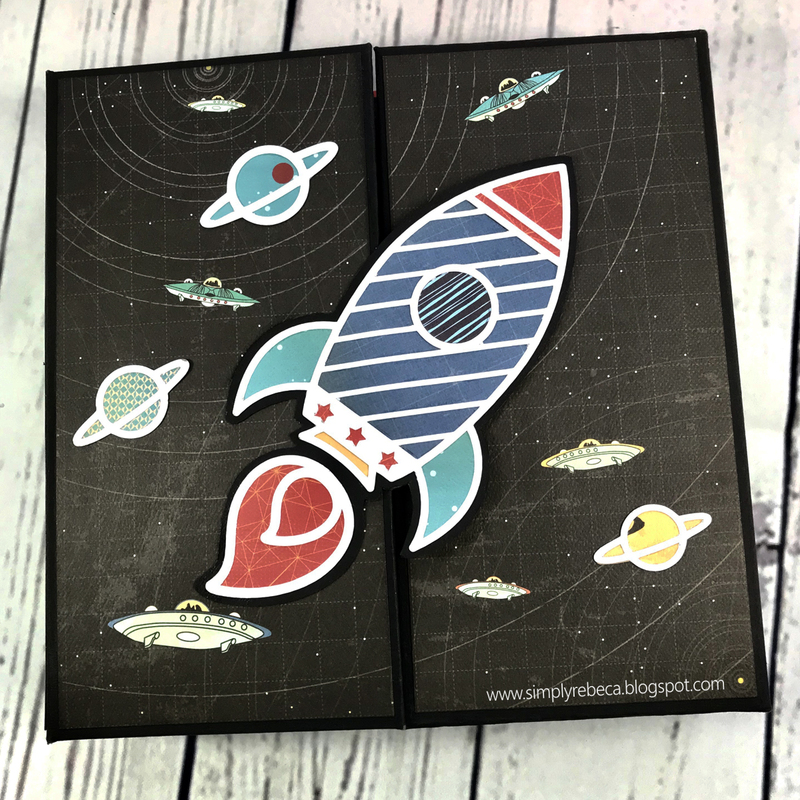 To remember this great experience I created a mini album, using the Gatefold XL Mini Album tutorial by Frances Long from Your Book of Memories. You can see a flip through video of my mini not so mini album at the end of this post. I'm a wife, mom and a pretty paper lover. I enjoy doing crafts but scrapbooking is my passion.